I put the flasher in this evening and the first one I tried worked fine. Thanks to Darus of ZEV for sending me a couple of flasher units along with the throttle, and for using Priority Mail. The bike is now behaving ok, with one exception: it still shuts off periodically. It happens mainly when I stop, but also did it once while I was making a slow left turn. Interestingly, pulling both brake levers at once seems to reset it, and I have power again without having to turn the key off. I suspect it *may* have been doing this all along, and the first time I thought I was out of juice. The second time would have been what I attributed to a broken throttle. Anyway, it passed inspection and I rode about 30km this evening, with the charger showing 74.6 volts at startup afterwards. The half turn throttle doesn't eliminate the off-stop 'lunge' but it does reduce it and make it more controllable. What it does even better is make the ZEV feel more like a motorcycle while cruising in the middle (2) power setting. I used Low and Medium to ride, using High only briefly a few times to make sure I still had range left - the controller locks out High initially as the pack gets low, then the middle power level, so I figured if I could still shift to High I was ok. The voltmeter on the right side of the panel never dropped below the middle of the dial, and if I read a 12 volt SOC table correctly, this should mean that at 74.6 volts I had used about half the pack's capacity. I was able to get enough cable fed back out of the bike to mount the Cycle Analyst on the right bar after all. It isn't wired in yet, but the position looks good. The only drawback is it makes "shifting" a bit more of an effort, and people with large hands wearing gloves may encounter a clearance problem, although I didn't. I took photos, and as soon as I figure out where to upload them and then link them, I'll post them here. I'm going to try to embed a couple of photos. Let me know if the images are too big. These show the Cycle Analyst and TNC throttle installed together. Frnt view of Cycle Analyst installed. The massive luggage rack was snapped off. 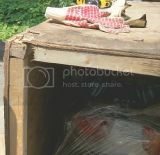 This was the only obvious damage to the outside of the crate! The rear wheel hit the back of the crate hard enough to dent the rim. I still have to mount the cargo box, but before I can do that I have to get into it. The key(s) was lost in transit. There may or may not be a spare inside it, with the mounting hardware. I owe the analog voltmeter an apology. It works just as well as the one on my XM-3000. When I thought I had run out of juice on that early ill-fated test ride, and probably when I thought the throttle I snapped back together was bad, it was actually the microswitches at the brake levers that were shutting the bike off. The switches are there to cut motor power while braking, and presumably to activate regeneration mode. Darus suggested I look at those, and it turned out that both of them (but mainly the right one) were too touchy, and were being activated by road vibration acting on the brake levers. So I removed the right lever, and ground off about 1mm from the activator pawl that extends from the lever to the microswitch. This eliminated about 80% of the shutoffs, so when I got back I did the same to the left lever. Hopefully that problem is now solved. Now to the ride: I started with a full charge, and rode an 18 mile country route that is hilly in some places and flat in others. I used "1" in my suburb and to climb the largest hills, "2" for most of the rest of the ride, and "3" just to check that I wasn't low on power. The bike responded and handled very well, albeit with some clunking from the suspension on some of the bumps. The TNC throttle really makes a difference on longer rides, giving the bike a smoother, motorcycle-like feel in its response. I have medium-length fingers, and I find the brake levers to be a bit of a stretch, but if I don't adjust to that I can probably custom-bend them to arch closer to the bars. The speedo worked fine, although a resettable trip meter would be very welcome. Once I have the Cycle Analyst connected I hope to be able to use that for trip info. I followed the ride in the country with a ride in a small city that's almost literally a stone's throw away from me. The voltmeter for the drive system worked as it should, showing, in an analog kind of way, how much load I was putting on the motor, and, as the pack got into the upper middle of its charge range, giving me a rough estimate of state of charge. I was pretty cautious, but I did do a few 'laps' around my suburb to bring the trip up to 45.1km (indicated). That translates to about 28 miles if the odometer isn't optimistic like most cycle speedos, or about 26 miles if it is. With slightly slower speeds and more use of Low, I'm sure I could have gotten 30 miles in mixed riding, and 35 if I really worked at it. When I reconnected the charger, the first number it read before they started to go up was 73.2 volts. If the reference chart I'm using is correct, that's about an 80% discharge. If anyone has a more accurate chart, especially one for 72 volt systems, I'd appreciate a link. Next I'm going to mount the cargo trunk, and after that tackle wiring in the Cycle Analyst. No fading of interest here. I enjoy reading ownership experiences of all makes and models. It's very helpful. So, thanks for taking the time to post. 70 degrees F is actually a bit cold for me and my cardio-vascular disease, but it was still somewhat humid yesterday, and the forecast is for highs in the fifties and sixties for the next full week, at least. So I got up a little early, bundled up a bit, gave the bike a little 3 minute pre-charge, and decided to see how far it will go in normal but gentle mixed riding. Darus of ZEV tells me that this model has been run down to 66 volts, so I crossed my fingers and stayed close to home. I left it in Low until I was out of my suburb, and put it back there for most of the hilly terrain and even some of the not-so-hilly. Low on the ZEV is, as another poster noted, a little frustrating, but I disagree on the reason. It isn't that you are limited to about 35MPH, it's that the controller keeps changing the top speed. I'd be cruising along smartly at almost 40, then the bike would seem to die as the controller dropped the output until I got back down to 30-35. This can be moderated with the throttle by not going as fast as you can, but it still happened to me a few times anyway. Medium power, or "2" in ZEV-speak, is a joy on this bike. It pulls smoothly and with enough power to feel like a motorcycle. What's more, the Gen 4 motor I now have has got longer legs in 2: while the Gen 3 motor would accelerate briskly up to 50MPH (indicated) and then stop right there, the Gen 4 will keep pulling on level ground up to an indicated 58 or so. Assuming the usual speedo error, 53MPH is really all I need for 95% of the riding I do. If I weren't trying to extend the range, I'd leave it in "2" all the time. High, or "3", seems to be a bit superfluous. The bike only accelerates very, very slowly when I "shift" into 3 at the top end of 2, so I think it's really only useful for downhill running, and maybe dead-flat highways where a few more MPH is needed. I still haven't gotten it above 60 in 3, but I haven't tried really hard, either - the route I took is country roads and highways where 45 is usually the speed limit, and I can easily exceed it in 2. The bike handles well and feels like a motorcycle, but maybe a bit more skittish in loose dirt, so watch out for that. Lowering the tire pressure would probably help, but at the cost of some range. The brakes work fine, but the levers are too far away from the grips for me to easily reach - I think I'm going to have to bend them in closer, once I confirm that they are a bendable alloy. I really like the upright riding position (I have a bad back), and while the windshield is far too low to keep my face out of the airstream, buffeting is not excessive. I also noted that I didn't get cold hands as usual (I was wearing moderately insulated gloves, as usual), so I think the fairing is redirecting air away from them. Maybe I won't even need the gigantic 'scooter mitts' I bought recently. The suspension keeps the wheels on the road with no difficulty, but it feels a bit too high at rest, as if the preload is set at maximum (I looked, but don't see an adjustment. Maybe there is one I'm not seeing). I'm also getting rather disturbing, solid, 'clunks' when going over certain kinds of bumps. I don't know it it's the suspension itself, or something else. Any of you other ZEV riders encountering that? The initial voltage indicated by the charger was 71.3 volts. I'm also getting rather disturbing, solid, 'clunks' when going over certain kinds of bumps. I don't know it it's the suspension itself, or something else. Any of you other ZEV riders encountering that? You don't have to be a ZEV rider to be experiencing similar 'clunks'. There are numerous possibilities on these Chinese-bred scooters for loose things such as fairings or fenders not bolted on correctly, and the big 'clunks' tend be the batteries hopping in their tray on very hard bumps. But those would tend to mildly hurt the rider also. A side or particularly main stand that is not held in retracted position sufficiently could also participate in clunking over bumps. And then of course such things as a toolset, charger or some other loose luggage under the seat could also make some noises, though that is very easy to find out compared to the other possible sources. Really bad clunking would be from the suspension itself, play in the steering head, swing arm bearing or in wheel bearings. This is the end of a week-long cold spell, and we have almost a full week of nice weather forecast. With that in mind, I mounted the cargo trunk that the Environment Friendly Store, at http://www.environmentfriendlystore.com/ was nice enough to include with the bike. It's a very sharp-looking trunk that looks like it was made for the ZEV, and although I had a little trouble using the existing reinforced bottom mounting holes and brackets with the ZEV bracket hole spacing, I was able to get it mounted properly. I used a thin sheet of rubber between the trunk floor and the rack surface. The push button latch got jammed when the rest of the bike was damaged, but a little lube and it's now working smoothly. I'm still visualizing and getting info on what I need to do to get the Cycle Analyst wired in. 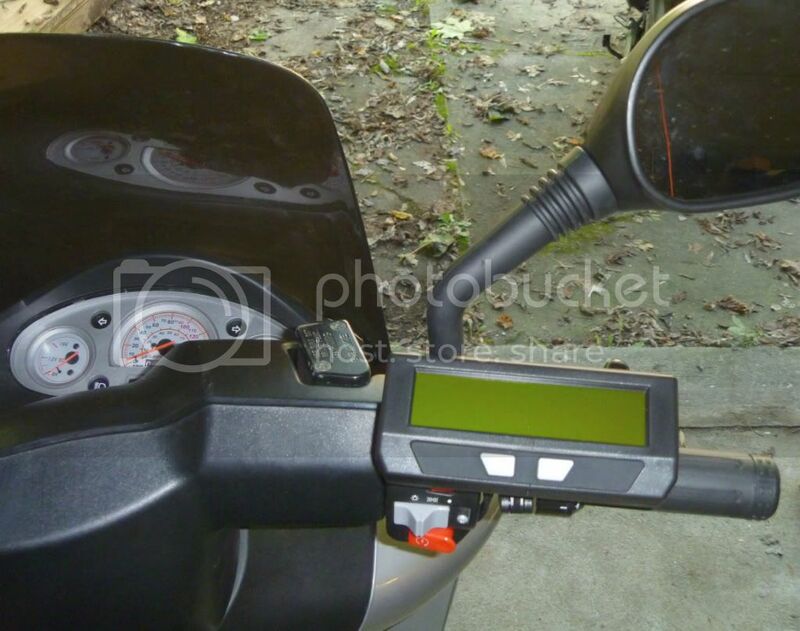 I could just connect the battery monitoring features easily enough, but I want to use the speedo function also, and that will require using the existing cable end to pull a guide wire out of the bike. The guide wire will then be used to pull both the CA monitoring cable and speedo cable back into the bike (the speedo cable is currently coiled up under the ZEV speedometer). Then I'll connect the magnetic sensor cable to the Hall "A" sensor cable going to the controller. One question: if there are two wires inside the speedo cable as I suspect, will the other one just be a ground that I can connect as such...? Oh, and I manged somehow to wrench my right arm - it hurts like hell when raised higher than waist height. Hopefully it will be better by Saturday, when I plan to take my next ride. Make it easy on yourself. Straighten a wire clothes hanger, at one end make a small loop or hook, feed it down into the battery area, then attach some cord/twine to it and pull it into the instrument area. Then attach the twine to your speedo cable and pull that back into the battery area. I just connected the speedo line to the hall sensor without using the ground (cathode) in the hall sensor cable and all worked great (CA already grounded through it's shunt- line and ground lines). Remember to remove C6 cap if you want the speedo to work properly. I don't really see how using a stiff wire hanger is easier than using the CA cable and a piece of similar wire as a guide. 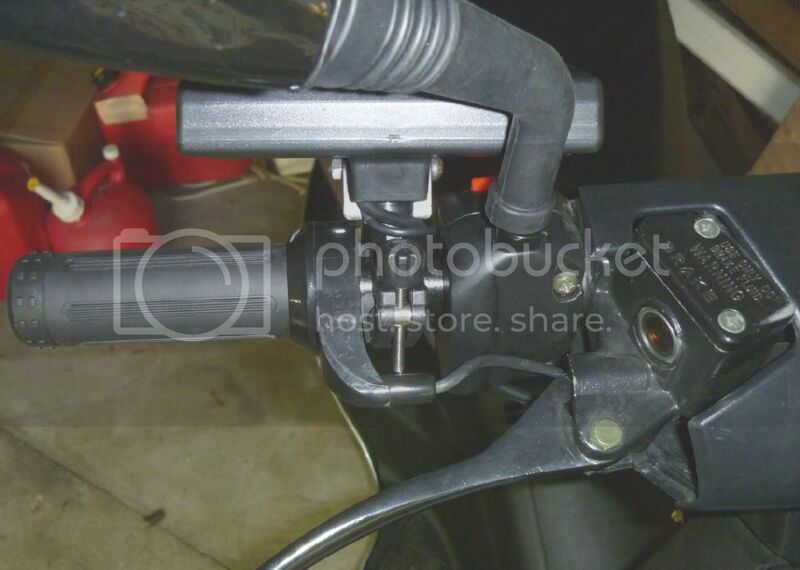 I did something very similar with the throttle cable and it worked fine. Thanks for the tip on the speedo cable, though - I figured it was grounded already, but wasn't sure it would work if I left the second ground wire alone. I have well-reviewed micro flush-cutters coming in the mail from Amazon.com to cut that capacitor. I hope to ride tomorrow. The high temp today fell a good (?) 7-8 degrees short of the 78F forecast, so I decided to take the XM for a spin instead of the ZEV. I didn't wear a warm enough jacket, so I was cold even cruising at about 35MPH. The XM now feels slower after riding the ZEV, but it's still a good little scooter, and I went 25km, mostly in High (but not flat out) and didn't exhaust the charge. I really have to get that front brake rattle fixed, though - it's very annoying. Tomorrow the forecast is for 80F, so even if it only hits 75 I'm taking the ZEV for a long ride - probably the 25-30 mile route above the East bank of the Hudson river and then back right along the river, that I take at the end of every riding season. I'll bring the charger along, in case I get a chance to opportunity charge along the way. If there is damage on a package, either refuse delivery of the package OR note the condition of the package in writing on the carrier's paperwork. Insist that the damaged package be opened while the driver is still present. Make a joint inspection with the delivery person, and note any discovered damage on the delivery receipt and on your copy. Personally, I would have refused delivery the first time it came damaged, and for *sure* if it came damaged the second time! Also, it may be different in the USA but I would never accept delivery of an unregistered bike. The dealer should register it in your name for you. (here at least...) That's what a dealer gets paid for, otherwise the maker could just ship it to you and cut the dealer costs out. There shouldn't ever be any issues that you need deal with regarding damage or registration. I did open the crate and note the damage with the driver present the first time. It looked like cosmetic damage only at the time, but even though it wasn't, the carrier paid (or is promising to pay ZEV) for the repairs, plus all extra shipping. In the US, registration is done by the owner. I should have remembered to thank Dave Dewbre of the Environment Friendly Store, and Darus of Z Electric vehicles, for making the return shipping and repair at the factory possible. Yesterday evening I decided to take my traditional 'Last Ride of Summer' route, which involves climbing up out of the Hudson River valley to Schaghticoke NY, then taking rte 40 to, IIRC, Argyle NY, at which point I turn left on rte 29 and head back down into the valley at Schuylerville NY. The views of the Hudson Valley are really spectacular in spots, and once I'm out of Schaghticoke the road is pretty flat. Usually I ride over the river to Schuylerville and back, but the plan today was to just go down the hill and turn left onto the winding country road that runs along the East bank of the river to Stillwater, and then along the West bank to Mechanicville, across the river from me. I've never measured the route, but I figured it was about 60km, with almost all of the second half either downhill or more or less level. I was still a few miles from Argyle and the odometer was reading about 40km. The voltmeter was indicating that I'd reached or exceeded the halfway point of the pack. I had brought the charger along - not being completely insane - and started looking for a place to recharge. No luck. I even stopped at a boarded up building with an outdoor outlet right by the parking lot, but the power was off. Getting a little desperate, I pulled into a yard where a garage sale was winding down. It didn't look like they had sold much, so I politely asked the man who came over to me if he had an outdoor outlet where I could recharge for 20 minutes or so, for a few bucks. Happily, he both had one and was friendly, so I was able to plug in. The pack was reading 74 volts when I started the charger. I played kick the ball with the two little kids who were playing there for about 25 minutes, picked out a few small items from the tables, and then because it was now past sunset, I gave the woman in charge of the sale $10 - five for the charge and five for the stuff. The pack had just reached 77.8 volts. Hoping that this would be enough on the remaining, easy part of the ride, I decided to press on, because the turnaround point was only about a mile ahead. I should mention that I had used Low to get out of my suburb, then, as it started to cut speed in its seemingly random fashion, I "shifted" to 2 (Medium) and left it there, keeping the speed between 40 and about 48MPH, indicated. After leaving the charging point, I cut back a bit, using Low to get to 20, then putting it in Medium and keeping it at around 35-40MPH. That run back down the river was *very* long; dark was falling and so was the voltmeter needle. By the time I reached the end of the road, across the river from Stillwater, the needle was not far at all above the Red and I was keeping it in Low. Oddly enough, under these conditions the voltmeter seems to drop more at speeds in the 20MPH range in low than it does in Medium. Anyway, as I turned onto the road over the bridge to Stillwater, the controller started to cut the power under acceleration as the needle dipped into the Red. NOT fun. Just into Stillwater, there is both a sandwich shop/convenience store chain (Stewart's, the place that told me they would not be offering any recharging services) and a Mobil station owned by a nasty piece of work who also runs the oil distributorship next door to us. I S L O W L Y cruised past the store first: the only outdoor outlet was by the ice machine, but was, unusually for these stores, about 6' off the ground, out of reach of my charger. I gave up and tried the gas station. The attendant was outside, and when I explained my plight, his response was to say "I'm not authorized to allow that" and then walk away. There was an outlet 4' from me. I was still about two or three miles from home, and the speed limit was about to go from 30 to 40MPH. I nursed the throttle like it was filled with nitroglycerin, and rode on the shoulder at about 15MPH, in the dark, with cars whizzing by the rest of the way. Amazingly, I made it. When I connected the charger again in my garage, the display briefly flashed 66.6, then immediately jumped to 70.0. The odometer on the bike told me I'd gone 83KM. My conclusion, drawn from this little adventure, is that for me, the ZEV 5000LA has a range of 30-50km, depending on how briskly I ride. I'd love to know if these odometers are optimistic like the speedos, of if they are fairly accurate. Anybody here know? I'm also going to carry a 9' large appliance extension cord at all times. My conclusion, drawn from this little adventure, is that for me, the ZEV 5000LA has a range of 30-50km, depending on how briskly I ride. I'd love to know if these odometers are optimistic like the speedos, of if they are fairly accurate. Anybody here know? Unfortunately they are usually optimistic (but by a different amount than the speedo). A good way of finding out the length of your journey is to use Google Earth - You can use the satellite view and trace the route you took and then get a read out of the distance (along with a nifty elevation view as well). You may also be able to do it with Google Maps (but I haven't tried that). If you're interested I can post some brief instructions. On my bike with the original Cheng Shin tires the odometer was fairly accurate and speed about 11% optimistic, but now with my IRC winter tires it appears the speed is nearing the truth from above, but the odometer is now reading shy of the travelled distance, because those tires have a slightly larger diameter. I second the proposal to trace a route you ride on GoogleEarth and compare the result with your odometer. GoogleMaps as far as I can see will only measure the flat distance, but I may be wrong. Yes, please do! I'd like to know the actual range of the bike under varying conditions. I just got back from an (indicated) 54km ride, this time on more back roads at lower speeds, but with some highway riding at an indicated 45-48MPH. I wasn't critically low on charge, just low enough to have it dip into the Red on acceleration if I wasn't careful. Oh, I definitely won't be doing that, believe me. Yesterday's near-debacle was the result of two miscalculations (trip distance and how much charge I got back in 25 minutes) that I don't plan on repeating. From now on, one is the limit! ;-) I figure that the length of time required for a good range-extending opportunity charge is at least 45 minutes, and preferably an hour or more. It's one of the big disadvantages of SLA batteries - slow recharge times. This evening I took another ride, this time to try two things: see if I can get some decent video footage, and try for top speeds. The video was another waste of time: it's surprisingly hard to get the camera aimed high enough to show more than the road in front of me. I may be able to salvage some screen shots of the instruments at speed, though. As for top speed, I decided, since there is little truly level road around here, to get two numbers: indicated top speed going downgrade on a highway, and indicated top speed riding on a country road along the river that has lots of dips and rises but is relatively level overall. Both runs would be done in "3" or "High". The first run was done after about 6 miles of brisk riding, and I got the bike to pull just above an indicated 70MPH on the downgrade. If the 11% error I've been quoted is accurate, that's about 62.6MPH. I then rode some hilly country roads in "2", and about 5 miles later got to the river road. I ran it up to an indicated 55MPH or so in "2" and then, as a loud, smelly Harley passed me, I switched to High and opened it up. Surprisingly enough, it would still pull an indicated 70MPH, which translates, hopefully, to an actual 62.3. I know the Gen 3 motor the bike came with wouldn't manage that from the two rides I took with it, so unless ZEV is putting Gen 4 motors in the 5000LAs now, I think I may have the fastest production version out there. Total trip distance was roughly 16 miles, with enough charge left for a few more miles of gentle cruising in "1." I do plan to connect the Cycle Analyst, but want to know the best way to access the controller wiring. Are those plugs push-fit, or held in with threaded collars? Darus mentioned pulling pins and soldering pigtails to the necessary ones, but I'm more of a splicer than a connector surgeon; I can solder small wires onto larger ones without cutting the larger ones, but I want to do this the best way I can manage. I got some good screenshots of the instrument panel, anyway, so I'll share them. Note that you can run this bike almost as fast in 2nd (about 50MPH) and use much less power than at a slightly higher speed in 3rd - look at the volt-gauge on the right. In the first snap, you can see the shadow of the camera rising above my helmet. My head is *not* normally pointed. Now the two best instrument snaps. I didn't get the top speeds, in part because I was trying to watch the less than straight road at the time. For some reason Photobucket always hangs up on my last upload, so the snap of the new motor may go in a later post...here is a shot of the bike with the cargo trunk mounted, instead. The only real problem with it is it won't hold a full-face helmet. I almost bought a much larger trunk on Ebay, for $69 on clearance, but didn't. Now I wish I had, and could put this one on the XM, instead. At least it *looks* great! Sorry to hear about the hostile reaction to your requests for an opportunity charge. Unfortunately, it is all too common. I can't figure what the hostility is about. My lithium-converted 40AH e-max goes at least 55 km, and my Current C124 goes 80km, which in compact greater Pittsburgh gets me everywhere I need to go. But previous to this, opportunity charging figured more prominently. My best luck with opportunity charging has been public parking garages (run by the city) or the outlets often found in planter boxes and garden walls of public parks, plazas or sidewalks for decorative lights. The alley-sides or back sides of businesses often have outlets amongst the trash cans or dumpsters. I would basically develop a mental map of electric outlet locations. 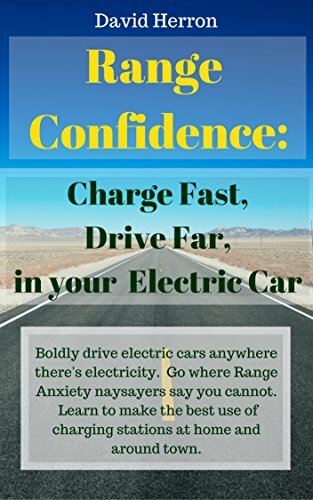 The simple addition or public coin-operated charging points would make range issues go away for all EV's, lead to an explosion in the market for EV's - and a source of income for the persons, businesses or local governments that operate the charging points. Win-win-win. I should have read you posts more carefully. I didn't know you scooter was SLA powered - I didn't know that ZEV offered that option. That charger problem you mentioned will be fatal to SLA's. They NEED to be topped-off at every opportunity. Is this a problem with the charger rather than design? When I used SLA's I never got more than a season of use before a cell in at least one battery would go bad - and this reduced range the same as the whole pack going bad. If you read a bit farther on, you'll see that the charger does indeed start charging regardless of level. It behaves oddly for an SLA charger, though: it starts in 'stealth mode,' with only the slowly climbing voltage level to show it's working. Then the cooling fan starts after a few minutes, which to me indicated bulk charging mode (used to get SLAs to 80% quickly), but in fact the fan just cycles on and off as needed to cool the unit. It doesn't seem to vary the charging rate much. It does work ok, especially when the pack has at least 25% charge left, like today: it recharged the bike in about three hours, instead of the usual 5-8 hours when the pack is lower. You probably ride a lot more than I do, but I've never killed an SLA battery. I had a *charger* kill one on the crappy LA Free Sport E-bike I had for a while, but the original AGM batteries in my Lepton still work, albeit at greatly reduced capacity, after 10 years. I'm getting quite frustrated at my attempts at making vids. The latest one is the best, but the #@#! @ camera was *still* pointed a bit too low, so most of it is too boring to show. I did have a friend shoot me leaving on my ride, using the HD video feature on my Panasonic digital camera, and that came out ok. I'm going to post it on YouTube shortly, although even that will be ruined by the watermark from an "unactivated" video editor. Anyone know of a good freeware or reasonably prices shareware editor? Here is the short vid of me leaving on a ride yesterday. I hope you like train whistles! Sorry I missed that, but was is the model you have ? A ZEV 6000 with SLA's ? Anyway, it is interesting to read about people's travels with EV's. Here in Sweden I usually have attracted interest with my electric scooter moped, and now motorcycle. It's a 5000 watt model with sealed lead/acid/silicone batteries. Kind of a bridge model between the slower 3600 and 4000 models and the faster 6100, 7100 and 8500 models. YouTube DSL upload speeds are ridiculously slow. I'm reminded of the bad old dialup modem days. Nonetheless, I should have the last and first segments of the vid up by this afternoon. The last segment is up now. And thanks for your video contributions too, they are greatly appreciated, at least by me!